Woodward Governor Company 8 CHANNEL RELAY PANEL, p/n 5441-673, is still in excellent condition. 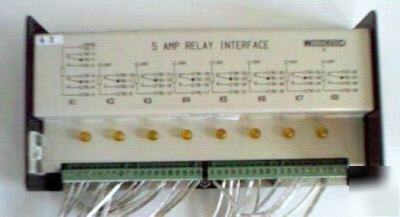 This relay module, and the others we have, are the type Woodward used for their 501, 503, 509 and NetCon 5000 controls. This is one of several similar units we have for replacements or parts. If you have any questions about this or our other Woodward Governor controls and parts, call or email us your question.